← Is this where we’re going? Putumayo Presents: African Blues-Playing For Change featuring Tinariwen “Groove in G” from Putumayo World Music on Vimeo. It’s such a huge contrast between the perception given here of musicians from around the world cooperating and playing together and the perception given in an article in The Atlantic Monthly by Ta-Nehisi Coates, “Fear of a Black President”, which emphasizes the visceral fear among some whites, most often conservatives, of black men in power like our Commander in Chief. Much as they love and promote their myth of American Equality, Freedom and Democracy, it is stunning how little Republicans practice it. 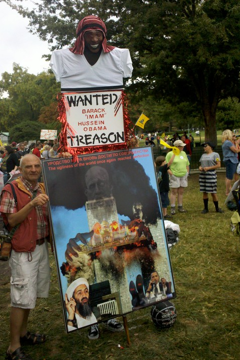 The underlying racism has been apparent since the first Tea Party rallies after Obama won the Presidential election. Remember these? And they say they aren’t racist?!!!!! seems patronizing and insulting to me, especially since it’s a lie. Romney doesn’t wish any such thing, nor does his party. They’ve spent all their efforts over the last 3 and a half years trying to engineer Obama’s failure as a President. NATIONAL JOURNAL: What’s the job? Quoted from ThinkProgress Oct 25, 2010. Unreasoning fear took over the Republicans in Congress to the point of nearly halting government operations and causing the downgrading of the US credit rating by Moody’s. What Congress needs is a few more musicians to show them what tolerance and working together can do. 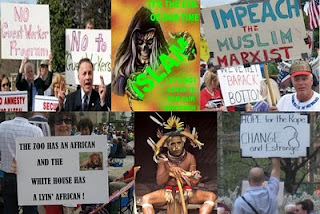 Posted on September 2, 2012, in Politics, Society and tagged AfricanBlues, Obama, Playingforchange, Putumayo, racism, romney. Bookmark the permalink. Leave a comment.